Here’s a post from 3 years ago. Tomorrow Queen Elizabeth becomes England’s longest reigning monarch! The longest reigning monarch in British history, and the longest reigning female monarch in the world, was Queen Victoria. She reigned sixty-three years, seven months and two days. 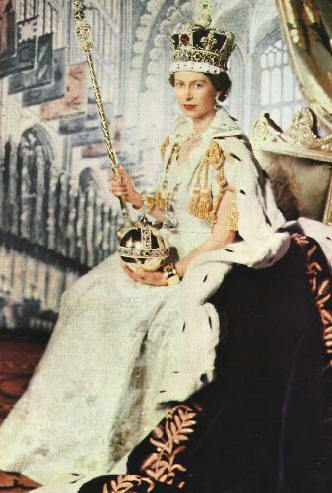 Queen Elizabeth II assumed the throne upon the death of her father, on February 6, 1952. She has been celebrating her sixty years on the throne this year, but if she can hold on for 3 years, she can smash the record! She needs to reign until September 8, 2015 to reach the record, so she’ll pass it on September 9th. GO Your Majesty, GO! So she has. It is not inconceivable that she will observe her centenary, whilst still reigning as Queen. Definitely not. I wonder if she’ll sign her own Centarian birthday greeting? And on Nov. 20, 1947, she married Prince Philip. I was not quite four years old, and my mom got me up in the middle of the night to listen to the coverage on the radio. She’s a tough old bird! 🙂 I got up in the middle of the night to watch Charles and Diana’s wedding. My paternal grandmother was an enthusiastic monarchist (Life member of the Imperial Order Daughters of the Empire), so I have lots of royal memorabilia, including a brooch that’s an accordion photo album of photos from Elizabeth’s wedding and coronation. And she’s done it! Queen Elizabeth and Queen Victoria are real role models for women.